Nationally recognized American Indian leader and civil rights activist Ada Deer is one of five individuals honored by the Society as a 2007 Wisconsin History Maker. The Wisconsin Historical Society celebrated the lifetime achievement of Ada Deer, along with four other individuals with Wisconsin ties, during the History Makers Gala in Milwaukee on Wednesday, May 9, 2007. Deer received the Robert and Belle Case La Follette Award for Distinction in Public Service. A nationally recognized social worker, community organizer, activist and political leader, Ada Deer is a champion of Indian rights who led the successful campaign to restore federal recognition of the Menominee Tribe. As head of the Bureau of Indian Affairs, she participated in the development of U.S. policies on international human rights and supported a strong national position on the rights of indigenous peoples everywhere. Born in Keshena, Wisconsin, in 1935, Ada Deer was the first Menominee undergraduate to receive a degree from the University of Wisconsin-Madison in 1957. 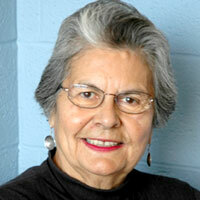 She became the first Native American to receive a Master of Social Work from Columbia University in 1961. When the federal government initiated a termination policy in the 1950s that led to the creation of a corporate body to manage the Menominee tribe, Deer helped to organize a grassroots organization to restore federal recognition of the tribe. Determination of Right and Unity for Menominee Shareholders, or DRUMS, successfully fought the government policy, which led to the Menominee Restoration Act of 1972, officially redesignating the Menominee as a federally recognized tribe. Because of her work, Deer became the first woman to chair the Menominee Tribe in Wisconsin, a position she held from 1974 to 1976. Deer ran for Wisconsin Secretary of State in 1978 and again in 1982. She served as vice chair of the Mondale-Ferraro Presidential Campaign in 1984. In 1992 she became the first Native American woman in Wisconsin to run for Congress, winning the Democratic primary without political action committee funding. The following year Deer was appointed the head of the Bureau of Indian Affairs, the first Native American woman to hold that position. While in office, Deer helped set federal policy for more than 550 federally recognized tribes, approved tribal-state gaming compacts, extended recognition to 12 tribes, and settled a century-long border dispute with the Crow Tribe that restored tribal lands and provided compensation for lost coal reserves and revenue. Both before and after her years in office, Deer taught classes at the University of Wisconsin-Madison School of Social Work. She developed groundbreaking classes in the 1970s on Native American issues and multiculturalism, and created the first program to provide social work training on reservations. She also co-founded the Indian Community School in Milwaukee, organized leadership workshops for Indian women, and helped to implement Indian participation in the Peace Corps. In January 2000 Deer became director of the American Indian Studies Program at UW-Madison. In 2007 Deer received the Wisconsin Historical Society's Robert and Belle Case La Follette Award for Distinction in Public Service. She is currently a fellow at the Harvard Institute of Politics at the John F. Kennedy School of Government.